New Holland | Beer Apprentice - Craft Beer News, Reviews, Interviews and Info. Hi folks. For today’s craft beer review I’m going to be trying the Rye Hatter brewed by the New Holland Brewing Company located in Holland, Michigan. We have been somewhat limited on the New Holland beers around my area in the past, but lately I’ve been seeing more and more on the shelves, so I figured I’d give a few more a try. From the website, newhollandbrew.com, I found this bit of info regarding the Rye Hatter. Rye lends spiciness to the caramel-malt base, while creating a creamy texture. Dry-hopping contributes a fresh citrus finish. This beverage came in a 22 oz. bottle with an ABV of 6.12%. It discharged a nice caramel amber to deep orange color. The cap was off white, smooth, creamy and soft. It was sized well and both the lacing and retention time were worthwhile. The aroma released tones of caramel malt, spicy rye bread and baked biscuits. Some resiny hops and a bit of pine came through as well. The citrus was light and airy with tickles of grapefruit and orange. Everything seemed to be rather harmonious with nothing distracting or out of place. Within the taste the fruitiness came forth a touch more. Especially the grapefruit. The biscuit and rye bread savors were there of course, but I also started to pick up on some light grassy and grainy tones. Some bits of pine protruded toward the end allowing the bitterness to become a player. Tasty. The mouthfeel was medium to medium/thin. Mostly dry, smooth and a touch crisp. The carbonation was medium strength and a solid dose of flavor was left behind between sips. This was a sturdy, sturdy beer. I really enjoyed it and hope that I have the opportunity to partake in it again sometime real soon. This brew had plenty of character and I believe that it could be enjoyed most anytime of the year for sure. Especially the Summer and Fall season. The drinkability was great and I put the entire bottle down with relative ease. 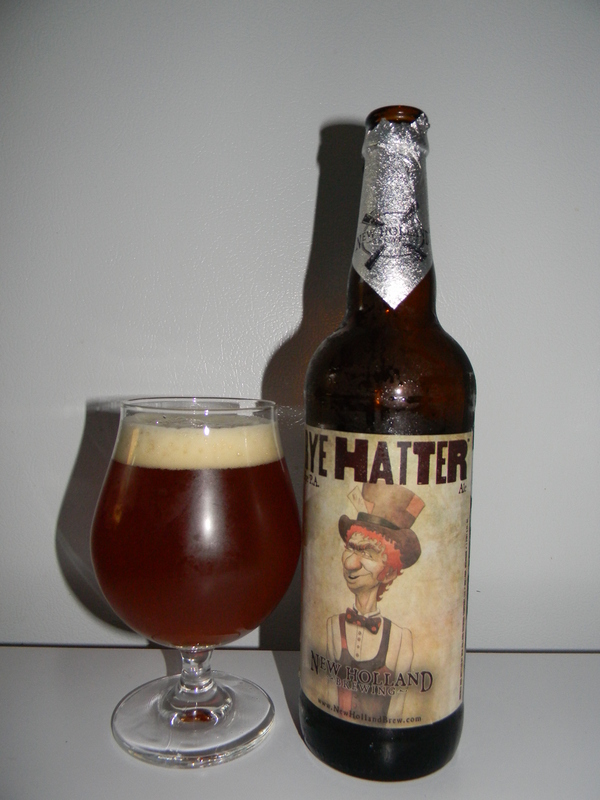 Without a doubt, I would recommend that you guys give the New Holland Rye Hatter a try if you get the opportunity. It might not be the greatest beer that you’ve ever tried, yet I guarantee that it would be far from the worst. For today’s craft beer review I’m going to be trying the New Holland Dragon’s Milk produced by the New Holland Brewing Company located in Holland, Michigan. I’ve never sampled this brew before. It’s an oak aged stout, which I tend to like, so I’m hoping for good things with this one. Let’s read the description from the website, newhollandbrew.com. The beer you hold in your hand, Dragon’s Milk Ale, is a crown jewel of New Holland Brewing Company. It is the unrivaled result of painstaking processes – both creative and scientific. We could tell you about the centuries-old tradition of the term, Dragon’s Milk, or we could tell you about the history, craftsmanship and challenges of important, the beer inside this bottle. Expect a complex ale with a soft, rich caramel-malt character intermingled with deep vanilla tones; all dancing in an oak bath. Unmistakably distinctive example of New Hollands’ Art in Fermented Form. This brew has an ABV of 10.0% and comes in a 12 oz. bottle. The beer poured a very deep brown color with a significant amount of ruby red showing through the middle and around the edges. The head was tan in color, very smooth, creamy, soft and full. The crown was of very good size, had very nice retention and left behind some very attractive lacing. This thing looked pretty darn good in the glass. The aroma began with hints of Bourbon soaked oak. Sweetness was added by tones of chocolate and some light vanilla hints. I found just a tad of dark fruit and caramel. Both seemed to be held back quite a bit to let the oak and whiskey shine. As the brew warmed, the beer seemed to lose some of it’s balance. The alcohol really started to step up and define this beer more and more. The taste lets the Bourbon rise to the occasion and the chocolate blends ever so nicely with the woody/oaky savors. The vanilla seemed to be quite a bit more relaxed in the taste than it was in the aroma, however I also stumbled upon some sugary sorghum that did add some reinforcement in the “sweetness” department. The overall taste was rather robust and potent, although it still had a nice bit of complexity. The mouthfeel was medium to medium/full. It was smooth, dry, creamy and chewy. The alcohol started with a hearty burn, yet gave way to a pleasant warmth on the swallow. The palate was left with a nice dose of flavor after the sip. Not bad here. Personally, I think it would be beneficial to let this beer age for a year or two to let the alcohol “settle in.” It seemed a little “green” to me. It still had a very full aroma and good flavor, but the drinkability was not all that high. One bottle of this would be all I could handle for an evening I think. I would still recommend giving this beer a try though. Especially if you like the “oak aged” stuff. I think I will try to seek out more stuff from New Holland and see how they stack up to other brewers that I’m more familiar with. Overall, I have read some very nice things about the brewery and their beers, so I’m eager to see what else they have to offer. Have you guys had the New Holland Dragon’s Milk? What did you think of it? Would you be able to recommend another brew from these guys? Thanks for reading and commenting everyone. Until next time.